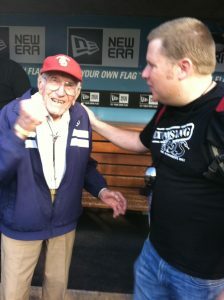 I was in the first base dugout of Dodger Stadium when I met Louis Zamperini. Louis had just addressed a stadium filled with 50,000 people at the evangelistic Harvest Crusades held in Los Angeles. He was well into his 90’s, yet Louis still had a skip in his step. And he had just walked off stage after sharing about how Jesus changed his life after World War II. It was a powerful testimony. As he approached where I was standing, I debated whether I should introduce myself. As a freelance video producer you are often in the company of well-known people, and you quickly learn to just treat them like everyone else and get your job done—but Louis was different. He was smiling and talking with everyone he passed. I knew it would be OK to say hi. Our meeting was brief, but somehow I was struck by the joy he had in Jesus. It was very clear that Christ was the focus of his life and he wanted everyone to know it. As I shook his hand, I felt like I was touching history. This man ran in the Olympics, met Hitler, fought for freedom in World War II, and survived the horrors of a Japanese prison camp. But more importantly, this man met Jesus Christ. His life was a living testimony to the saving power of Christ. When he came home from the war, he was a broken man. Though he had shown an “unbroken” spirit of resolve, the reality was that the torment of war and torture took its toll. He turned to alcohol to distract himself from his nightmares. His marriage was on the rocks. And then one day in 1949, when his wife had enough, she took him to the now famous Billy Graham Crusade in Los Angeles. And just at the moment that Louis wanted to run out, Billy uttered profound words that caught his attention, “Here tonight, there’s a drowning man, a drowning boy, a drowning girl that is lost out in the sea of life,” Billy proclaimed. But as Billy continued to preach, he told of “hell and salvation, men saved and men lost.” This ticked Louis off and he quickly left during the prayer. That night, Louis had more nightmares. Though he did not want to return the next day to see Billy preach, he agreed to go on one condition—that they leave during the prayer. Billy preached that night about mankind’s need for Jesus and how God works through suffering. Once again, this irritated Louis. When the prayer began, he and his wife slipped out again. But before he could leave the tent, God captured Louis’ heart by reminding him of a promise that he had made when he was lost at sea. Louis remembered that he prayed, “If you will save me, I will serve you forever.” That night, Louis gave his life to Jesus. He went home and poured out all of his liquor. He slept peacefully for the first time in five years. And he began to read the Bible for himself. The broken man was now a new creation in Jesus. 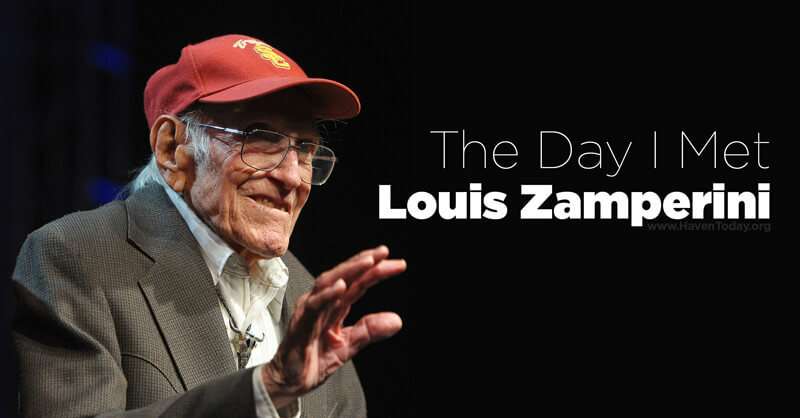 Louis went on to speak for decades about how Jesus can change lives. After all, he was a perfect example of God’s power working in a broken life. He no longer had anything to prove. He no longer had to earn anyone’s respect. Louis had been saved by grace and was full of zeal to tell people about Jesus. He helped to start a camp for delinquent kids. He shared the gospel on network news. And he went back to Japan to forgive his captors and share the gospel with them. Back in Dodger stadium, Louis was still serving the Lord as he shared his faith with tens of thousands of people. He was the same man on stage that I met backstage—full of energy and grace. I’m thankful that I got to hear him share about the most important part of his life on that warm, summer evening. Despite his heroics that are celebrated in the book and movie, Louis would tell anyone that if he had died a hero without Jesus, it would’ve all been for loss. But after he received the grace of Christ, his life had been forever changed. Troy Lamberth is the executive producer of HAVEN Today. On the side, he teaches film at Providence Christian College, produces documentaries, and often teaches at his church. He enjoys discovering how Jesus is involved in all aspects of our lives—from faith to film to family—and how our relationship with him shapes the way we live. He and his wife Melissa have three young children.